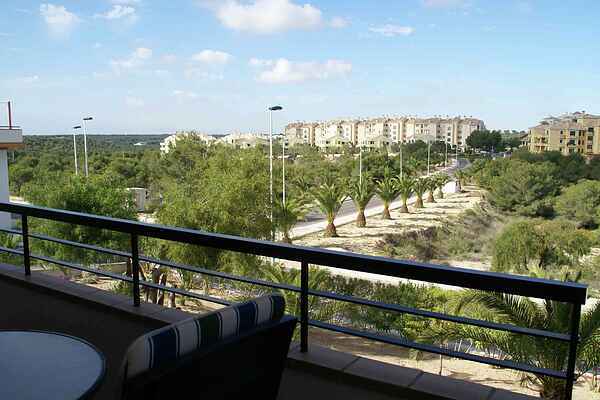 A beautiful apartment, right next to the golf course of Campoamor. This nice 18-hole golf course is built on a series of sloping hills. You hit your ball with a view of the clear blue of the Mediterranean. The magnificent surroundings of this apartment will make you want to set out to explore the area often. At the apartment you can enjoy the tennis courts, gyms and several indoor and outdoor pools that are part of the resort. Perhaps you would like to try another golf course? Within a radius of only 20 kilometres from Campoamor are no less than 6 other golf courses. The coast near Campoamor (5 km) is only a short drive away. Here you find the beautiful 'deserted' white beaches. At a walking distance you can find a supermarket, bank and several bars and restaurants. You can rejoice in the culture of the beautiful city of Murcia (60 km) with its magnificent cathedral and its dazzling baroque façade. In the centre of the city you can find great number of cosy terraces and restaurants where, with a nice glass of Spanish wine and delicious tapas, you can let all the impressions sink in. A visit to Elche (60 km) is also a must. This city is mostly famous for the palm tree garden with more than 200,000 palm trees.